What's taking Foodie's South Boston so long? Many South Boston residents are asking the same question. For those of you that read this real estate blog, you'll remember in June 2012 when I wrote that Foodie's would be opening September 2012. 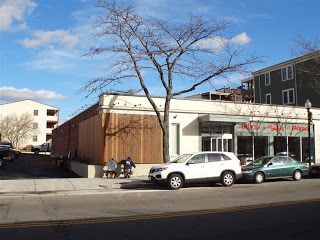 Well, here we are on December 5th, 2012, and as many residents know, Foodie's South Boston is still not open. I haven't heard any groundbreaking updates other than the owner has continued to encounter unforeseen issues with the site. The photo to the left was taken today. You can't see them in this photo, but the shelves, lighting, and registers are all in the place, but there is no inventory. Based on the way things have gone, I'd say they are 2 weeks away from opening, but I wouldn't be surprised if that didn't happen until on or after January 1st, 2013. For us at Terrier Residential, it will be great to have another lunch option. I'm excited that Foodie's plans on having a prepared food section, similar to Whole Food's. The delayed opening has been frustrating, but once Foodie's South Boston finally opens, it will be an enormous addition to the neighborhood. Let's hope it happens in 2012!